ACMI has installed an innovative repacking line for shrink-wrapped packs at the Polish site of Znin belonging to the PepsiCo Group. The line in question allows the repackaging on half pallets of shrink-wrapped packs packaged on whole pallets coming from the store and of shrink-wrapped packs coming from the production line. Going into detail, the line is equipped with three loading bays for receiving the whole pallets from the store (off-line mode), but may also receive one of the three products directly from the production line (on-line mode). In the latter case of the three loading bays, only two are used. As a whole the line can mix up to three different flavours of product, provided that each pack has the same dimensional characteristics. It is impossible, that is, to obtain outfeed pallets made up of packs that have different dimensions between them. 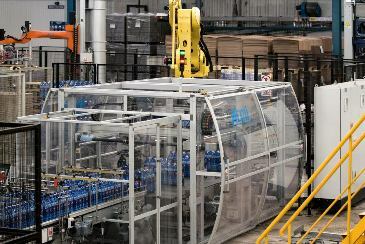 The repacking line installed at the Pepsi plant reaches a maximum production of 25 pallets per hour and can handle shrink-wrapped packs of 2×2 and 4×2 with bottles of 0.85 – 1.25 – 1.75 – 2 and 2.25 litres. The depalletisation phase is entrusted to a 700 kg Condor model robot. 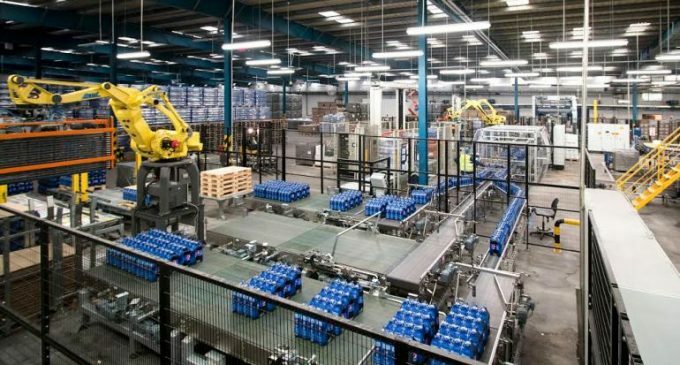 The robot, which was equipped with a special gripping head, picks up alternately from three pallets coming from the store a complete layer of packs at a time and deposits them on the discharge conveyors. Following the preset depalletisation programme, the Condor robot operates effectively both the gripping phase and the unloading phase of the product also taking care of the storage of the interlayers and pallets. The system presents a high level of automation and flexibility that allows it to reach significant working speeds and ensure perfect integrity of the product at the same time. This is possible thanks to the special gripping head designed by ACMI which was equipped with the perimeter pad system and the sliding table with symmetrical opening and carbon rollers typical of the palletisation systems. The packs deposited on the discharge conveyors reach on three independent lanes the infeed of the Twisterbox layer formation system which is the core of the mixing and palletisation system. One of the three Twisterbox infeed lanes can, if necessary, receive the packs directly from the production line, thus obtaining a mixed repacking system, both off-line and on-line. The Twisterbox is configured with one module consisting of concentric closing carbon grippers. The Twisterbox receives the packs from the depalletisation zone and/or from the production line and combines them producing the preset palletising pattern. In this way, having three products available at the infeed which can be managed independently, the system produces a mix of packs depending on customer requirements. 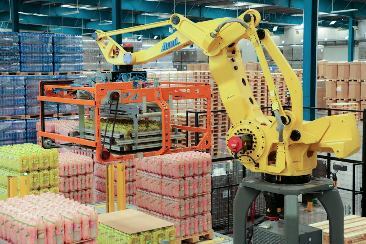 The layer of mixed packs is transferred to the openable platform head of the Condor P136 model robot which deposits them on two half pallets placed side by side. For each palletisation cycle two half layers are therefore produced, each containing the required product mix. Palletisation of two half pallets with mixed flavours. 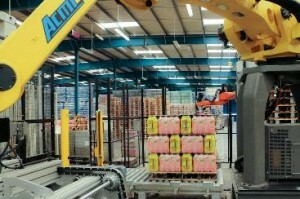 The palletiser is equipped with a SCARA type robot designed by ACMI to handle half pallets and interlayers. This particular robot deposits the half pallets and inserts the half interlayers between the layers. Once completed, the two half pallets are sent to the rotating ring stretch wrapper and wrapped individually. Overall, the line installed in Znin is presented as a highly flexible and fully automated line. All the format changeover operations are managed through an operator panel and no manual intervention is required for the operation of ACMI machines. The only manual operation remains, of course, the pallet film removal at the line infeed. Thanks to the system designed by ACMI, PepsiCo Poland can respond effectively and flexibly to the demands of the outlets, whether they are local shops or large-scale retail stores.